The National Dog Show presented by Purina on Thanksgiving Day, noon on NBC, is more than just an incredible dog show. The hope is that you can see what the human-animal bond is all about. 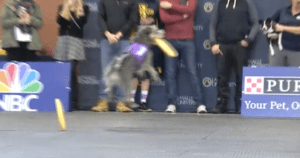 The Purina Incredible Dog Challenge team paid a visit to LaSalle University in Philadelphia to show off what they can do. The college kids loved it. Of course. And Purina is even working on ways to make this relatively small college pet friendlier. And when it happens at LaSalle, the hope is other schools may follow. I also speak with Incredible Dog Challenge lead trainer Lourdes Edlin, and why your dog may be more capable than what you think. Yes, the dogs in this video are incredible but so is your dog. 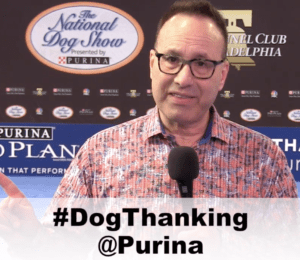 From now through November 25 if you (hashtag) #dogthanking on Instagram, Facebook and/or Twitter and offer a sentence or phrase on why you are thankful for your dog and tag @Purina, $1 goes to the Tony LaRussa Animal Rescue Foundation Pets and Vets Program, which he talks about in this Facebook Live. The program pairs shelter dogs with veterans who have returned from combat with post traumatic stress disorder syndrome. In the Facebook Live, I also speak in FAR more detail to Edlin about dog training and some amazing things dogs can do, even finding wild tegu lizards in Florida.